Inspired, of course, by. . . Whole lot of flashbacks working on this one. But one in particular stands out. 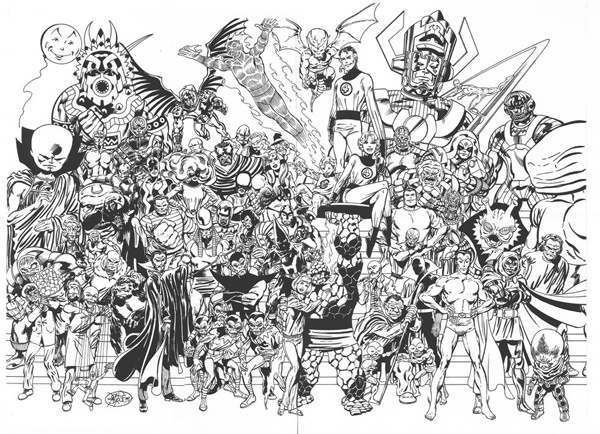 Of course, after all these years, I had to pull reference for a lot of these characters, including the Hellfire Club guys. Flipping thru those issues, I came across the scene where Wolverine attacks the guards in the basement of the Club. At one point one of the goons gets the drop on him, and fires at him with a machine gun. Wolverine drops behind some crates, to emerge virtually unscathed a few seconds later. When we plotted that moment, Chris and I were playing up Wolverine's "healing factor". The dialog was supposed to indicate that the slugs had gone straight thru, which is why Logan why able to heal so fast. But when Shooter saw the pages, he ordered Chris to rewrite it, indicating that the shots had only "grazed" Wolverine -- which was, of course, not at all what I had drawn. Logan healing that fast was, Shooter declared, "unrealistic". Time it was, and what a time it was. . . Absolutely brilliant,the buyer has got a real gem. Just made me smile.....Nice job. Wow, that's the ultimate visual retrospective. Does anyone have a link to the Fantastic Four inspirtation? There it is. . .
After I "finished" the piece, I sat staring at it for several minutes, seeking out that one unfinished detail that almost always seems to appear after I have scanned the work. In this case, it's Cyclops' left forearm, which is lacking the blacks. ARGH!!! Really love the smiles on all the X-men's faces. Banshee looks great with the pipe. Even got a robot nanny! Congrats Nathan Christmas comes early.Anybody seen Juggernaut? Except for a brief "walk on" with Black Tom Cassidy, Juggernaut did not appear during my run. I opened the page and the words "Oh . . . my . . . god" dropped from my slackened jaw. awsome!! What a visual treat. I've never seen the FF piece either so a double treat for me. Thanks for sharing, JB!! WOW!!! I'm definitely gonna have to steal this one. Holy Mackinnolly!!!!! I feel like I've just seen pictures from a really cool reunion. This is just too much greatness for my brain to process fully. That's a lot of work. Wow. What a way to start a Monday! Hopefully this is a good omen of the week to come. Ok, seriously, that's just an incredible piece. Whomever gets it has a true prize. Well, there's a Walter. . . Okay, no Waldo. But there IS a "Mystery Guest". Can you spot him? JB, every character you draw looks "right" no matter who the first artist to draw them may have been. Presumably this is Nathan's and ods bodikins, what a wonderful, monumental piece of X-art. What does the sign say that Aurora is holding up? Took me ages to spot the young Kitty Pride, for some reason. 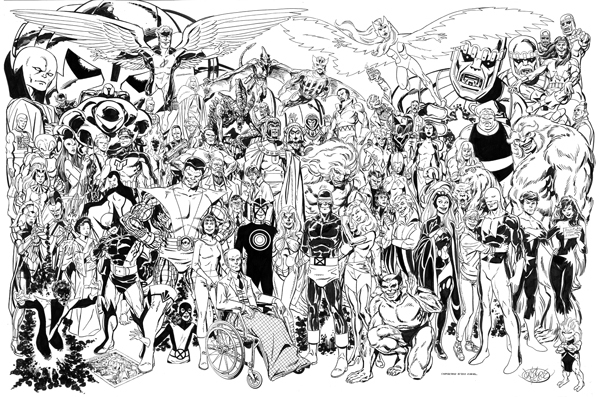 Everyone looks as they should -- quite an accomplishment to draw so many characters so many years later and have them all look darn near definitive. I like how relaxed and content the good Professsor looks, and how miserable and scared the future Logan and Kate Pryde look. Other nice touches include how cheerful all the Alphans are with the exception of Northstar, the presence of Senator Kelly, how dastardly you always manage to make Mastermind look (Boo! Hisssss!) and the nice symmetry formed by Angel and Snowbird. Everywhere you look summons the ghost of a fondly-remembered storyline. Looking forward to poring over the details when the full sized one appears. That is a truly amazing piece! Whoever commissioned this is gonna be one happy camper!